A new survey by Zogby International finds that people in Mexico think that granting legal status to illegal immigrants in the United States would encourage more illegal immigration to the United States. As the top immigrant-sending country for both legal and illegal immigrants, views on immigration in Mexico can provide insight into the likely impact of an amnesty, as well as other questions related to immigration. A clear majority of people in Mexico, 56 percent, thought giving legal status to illegal immigrants in the United States would make it more likely that people they know would go to the United States illegally. Just 17 percent thought it would make Mexicans less likely to go illegally. The rest were unsure or thought it would make no difference. Two-thirds of Mexicans know someone living in the United States; one-third said an immediate member of their household was living in the United States. Interest in going to the United States remains strong even in the current recession, with 36 percent of Mexicans (39 million people) saying they would move to the United States if they could. At present, 12 to 13 million Mexico-born people live in the United States. A new Pew Research Center poll also found that about one-third of Mexicans would go to the United States if they could. An overwhelming majority (69 percent) of people in Mexico thought that the primary loyalty of Mexican-Americans (Mexico- and U.S.-born) should be to Mexico. Just 20 percent said it should be to the United States. The rest were unsure. Also, 69 percent of people in Mexico felt that the Mexican government should represent the interests of Mexican-Americans (Mexico- and U.S.-born) in the United States. A plurality, 39 percent, of Mexicans thought that in the last year fewer people they know had gone to the United States as illegal immigrants compared to previous years. Only 27 percent thought more had gone. The rest thought it had stayed the same or were unsure. A plurality, 40 percent, also thought that in the last year more of the illegal immigrants they know had returned to Mexico compared to previous years. Only 25 percent thought the number returning had fallen. The rest thought it had stayed the same or were unsure. Both the bad economy and increased immigration enforcement were cited as reasons fewer people were going to America as illegal immigrants and more were coming back to Mexico. As the nation debates the issue of immigration, the perspective of people in Mexico is important because Mexico is the top sending country for both legal and illegal immigrants. In 2008, one of six new legal immigrants was from Mexico and, according to the Department of Homeland Security, six out of 10 illegal immigrants come from that country.1 Asking people in Mexico their views on immigration can provide insight into the likely impact of an amnesty for illegal immigrants and other questions related to immigration. The survey reported in this Backgrounder is the first to ask people in Mexico if they think legalizing illegal immigrants in the United States would encourage more illegal immigration. The survey was conducted in August and September 2009 and consisted of 1,004 in-person interviews of adults throughout Mexico. The findings show that a majority of people in Mexico think an amnesty would make it more likely that people in Mexico would come to the United States illegally. This is especially true for people who have a member of their household living in the United States. It is important to note that respondents were asked specifically about whether an amnesty would make illegal immigration more likely, not just immigration generally. Other questions in the survey explored attitudes about migration to the United States generally, recent trends in migration, and loyalty to the United States. The in-person survey in Mexico included 1,004 persons 18 years of age and older and was conducted in August and September 2009. The sampling framework was the most recent (2009) electoral sections defined by the Federal Electoral Institute. A multi-stage sampling procedure was employed that first randomly selected 100 electoral sections proportional to size. Second, two house blocks were randomly selected from each section. Within each block, five households were selected using a systematic random procedure. The margin of error for the entire sample is +/- 3.1 percent, for a 95 percent confidence level. Margins of error are larger for sub-groups. Table 1 reports the questions and responses of people in Mexico. Question 1 shows that most people in Mexico (56 percent) think that if the United States granted legal status to illegal immigrants it would make it more likely that people they know (friends and family) would go to America illegally. Just 17 percent thought it would make people they know less likely to go to America illegally. If we focus on the one-third of Mexicans who have a member of their immediate household in the United States, 65 percent said a legalization would make it more likely that people in Mexico would go to the United States illegally. Question 2 shows that interest in going to the United States remains strong even in the current recession. The survey shows that 36 percent of Mexicans say they would move to the United States if they could. The Zogby poll is supported by results from a new Pew Research Center poll that also found that about one-third of Mexicans would go to the United States if they could.2 The total population of Mexico is 105 million, so 36 percent could represent a potential out-migration of 38 million people to the United States. Of course, many Mexicans who say they would like to live in America will probably not actually act on that desire. But even if only half of those who expressed an interest in living in America are actually serious, it still would represent nearly 19 million people. At present about 12 to 13 million Mexico-born people live in the United States.3 The United States is currently issuing roughly 200,000 green cards (legal permanent residence) a year to people from Mexico. The results of this Zogby poll indicate that even doubling or tripling that number likely would not meet the demand of people in Mexico who want to live in the United States. Any level of immigration the United States might conceivably set for Mexico would require significant enforcement efforts to deter the even larger number of people who want to come here. The very large number of people who expressed an interest in coming to the United States suggests that our enforcement efforts have been successful in deterring significant numbers of people from coming illegally. Most discussion of enforcement focuses on the 10 to 12 million illegal immigrants in the country, seven million of whom are estimated to have come from Mexico.4 But this poll suggests that many people who might like to come have not done so. This could be seen as an indication that enforcement efforts are effective. Questions 3 and 4 ask about political representation and loyalty for people of Mexican ancestry who live in the United States. Both questions used the term “Los estadounidenses de origen mexicano.” This translates as Americans of Mexican origin. Another way to put it would be Americans of Mexican ancestry or simply Mexican-Americans. In Spanish it is understood to include people born in Mexico who live in United States and people born in the United States with family roots in Mexico. Question 3 shows that the overwhelming majority (69 percent) of people in Mexico think that the Mexican government should represent the interests of Mexican-Americans in the United States. Only 20 percent of Mexicans think the Mexican government should not represent the interests of Mexican-Americans. Question 4 shows that 69 percent of people in Mexico think that the primary loyalty of Mexican-Americans should be to Mexico. Just 20 percent think their primary loyalty should be to the United States. Questions 5 through 8 explore how people in Mexico see current trends in migration. 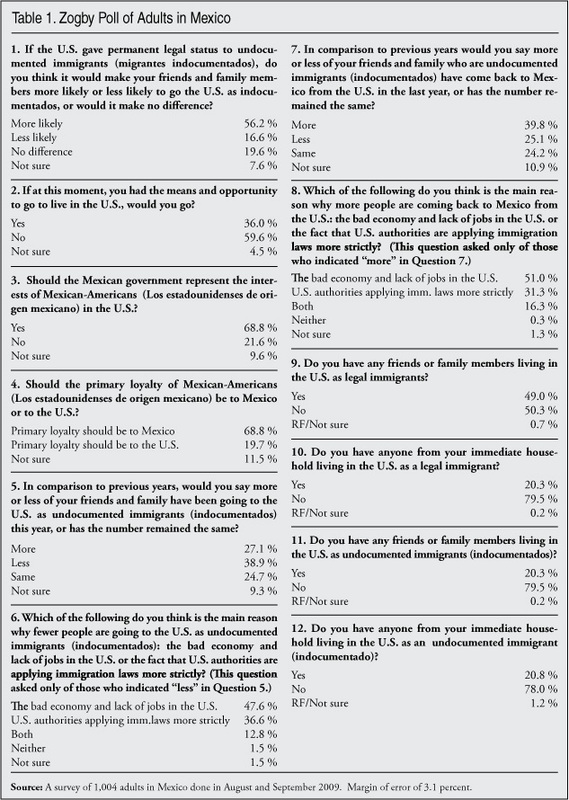 Questions 5 and 7 show that a plurality of Mexicans think fewer people are going to United States illegally and more illegal immigrants are returning to Mexico. In a previous study based on U.S. Census Bureau data, the Center for Immigration Studies estimated that new illegal immigration has fallen and return migration of illegal immigrants to Mexico has increased. Question 7 does show that a plurality (40 percent) of Mexicans think more of the people they know are returning. This is consistent with our prior findings based on Census Bureau data. Of those who think fewer people are going to America and more are coming back, both the bad economy and increased immigration enforcement are cited as reasons. Questions 9 through 12 ask about friends and family members in the United States. All the questions show just how common it is for people in Mexico to know someone living in the United States, legally or illegally. Question 7 shows that almost half of the Mexican population reports having a friend or family member living in the United States legally. Question 9 shows the same thing about illegal immigrants, with 52 percent responding that they know someone who is in the United States illegally. This may seem implausible, but it actually makes a good deal of sense. Most estimates show that, of the roughly 12 million Mexican immigrants in the United States, slightly more than half are in the country illegally. Question 8 shows that 20 percent of respondents had an immediate member of their household living in the United States legally and 21 percent had a household member living in the United States illegally. It is very important to note that there is overlap in questions 9 through 12. That is, many individuals know both legal and illegal immigrants living in the United States. The same holds true for those who have a member of their household in the United States. For example, of Mexicans who said they had friends or family members living in the United States as legal immigrants (Question 9), 63 percent also said they had friends and family members living in the United States as illegal immigrants. Of those who said they had an immediate member of their household living in the United States legally (Question 10), 45 percent said they also had a household member living in the United States illegally. In total, 69 percent of Mexicans said they knew someone living in the United States, legally or illegally. Also, one-third of people in Mexico said they had a member of their immediate household living in the United States legally or illegally. This reminds us of the close relationship between illegal and legal immigration. It is very common for people to come to America illegally and eventually become legal residents.5 It is also very common for illegal immigrants and legal immigrants to live together in the United States6 and for people who have relatives living legally in the United States to join their relatives without authorization and live here as illegal immigrants. Legal and illegal immigration are not separate social phenomena. High levels of legal immigration tend to create high levels of illegal immigration. In fact, all of the top sending countries for legal immigrants are also the top sending countries for illegal immigrants. The results from the Zogby poll confirm what is already well known — legal and illegal immigration are closely connected. The views of people in Mexico on immigration and related issues are clearly important. In 2009 some 12 to 13 million people from Mexico lived in the United States, accounting for nearly one-third of the entire foreign-born population. The findings of this survey show that people in Mexico think that if the United States were to legalize the 10 to 12 million illegal immigrants in this country, it would encourage more illegal immigration. This is especially true for those who have a member of their household living in the United States, with 65 percent of these individuals saying it would make the people they know more likely to go to America as illegal immigrants. This is worth thinking about since people in Mexico may be in the best position to see how an amnesty would be received in the top illegal-immigrant-sending nation. The survey also found that more than one-third of people in Mexico (38 million) would like to live in the United States if they could. This clearly shows that the desire to come to America remains very strong in that country. This means that if there was an amnesty in the United States, a very large number of people in Mexico might come illegally in the future in the hope of qualifying for another amnesty. Another important finding of the survey is that most people in Mexico think that the 32 million Mexican-Americans in this country, most of whom were born in the United States, should give their primary loyalty to Mexico. They also think the Mexican government should represent the interests of Mexican-Americans in the United States. If this view is widespread among Mexican Americans in the United States, such attitudes could make the assimilation and full integration of people of Mexican ancestry more difficult into American society. Finally the survey shows just how common it is for people in Mexico to know someone who lives in the United States. In addition to knowing people in the United States, one third of Mexicans indicated that a member of their immediate household lives here as a legal or illegal immigrant. Clearly there are large and well-developed social networks of friends and family between the United States and Mexico. Thus, if there is an amnesty, these networks could stimulate more illegal immigration. The results of this survey certainly indicate that most Mexicans think it would. 5 A study by the Public Policy Institute of California, based on the New Immigrant Survey, found that 42 percent of new legal immigrants had lived in the United States illegally prior to getting a green card (legal permanent residence). See “Immigrant Pathways to Legal Permanent Residence: Now and Under a Merit-Based System,” at www.ppic.org/main/publication.asp?i=768. Another study found that about one-quarter of those who received a green card between 1999 and 2002 were illegal immigrants adjusting status from within the United States using a provision in the law at that time called 245(i). See “The Truth Behind 245(i) Amnesty,” at www.fairus.org/site/DocServer/ACF2C67.pdf?docID=381. 6 See, for example, the Urban Institute study “Under One Roof: Mixed-Status Families in an Era of Reform,” at http://www.urban.org/publications/409100.html. Also see a series of reports by the Pew Hispanic Center on the illegal population, which show the “mixed status” of many immigrant households.Pew’s most recent report is at http://pewhispanic.org/files/reports/107.pdf.